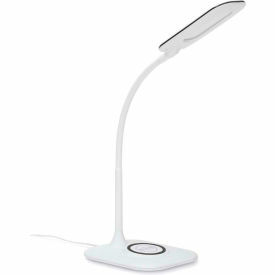 Brighten your life with the OFM Essentials Collection LED Desk Lamp with Integrated Wireless Charging Station, in White. A no bulbs required LED light that only consumes 15 watts of power, this desk lamp provides 420 Lumens and creates a contemporary accent for any space, home or office. The color temperature is 5000 Kelvin, allowing this small table lamp to provide amazing white accents. This gooseneck lamp has a flexible design that allows the lamp to move in any direction. The sleek molded base allows for integrated wireless charging for your Apple or Android phones enabled with wireless charging. A wireless charging receiver patch is included that will allow your iPhone 5 (and up) and Android micro USB devices to charge wirelessly too! 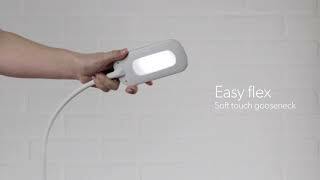 This soft touch control lamp has an on and off switch that allows the lamp to transition between 3 levels of brightness. This lamp is 21" tall and extends out 12" from the center of the base. Lighting is covered by the OFM Limited Lifetime Warranty.